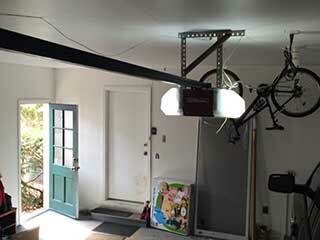 Our company provides all sorts of repair and installation services regarding automatic garage door systems. However, that's not all we do. We also provide homeowners with a regular maintenance routine that serves to keep their door fully functional and prevent a lot of malfunctions from manifesting. To avoid premature breakdowns, our technicians will lubricate the torsion springs (if you have them) and test their tension. If we find that the door is getting unbalanced, we'll simply perform the required spring adjustment on the spot. Doing this on a regular basis will help reduce the working strain of these components and the wear and tear that they naturally go through. Another part of our garage door maintenance service is checking to make sure that your opener is able to operate without compromising your safety. We'll make sure the alignment of its safety sensors is correct and that the door reverses when an obstacle is blocking its way. We will also make sure that the circuit board isn't damaged and that the motor gear hasn't become too worn to function properly. If we find some component isn't fully operational, we'll simply replace it with a new one. The aforementioned parts aren't the only ones we'll check. Our technician will focus on each and every single one of the different components that make up your automatic garage door. That means we'll examine the panels for dents, the tracks for bending, the cables for fraying and every other part of the system for the type of damage that could be affecting it. Any minor issue we come upon will be repaired on the spot, which will prevent all sorts of more serious problems from developing later on. Our team at Garage Door Repair Vista is waiting for your call. Reach out to us today using our online system or the "old fashion" telephone (or smartphone, really). We'll make sure your system receives the maintenance it deserves.